There are many areas in which commercial beekeepers play an essential role. As one notable example, the largest almond market in the world – California – is very heavily dependent upon thousands of beehives being moved in each year, as a “utility” of sorts to drive pollination on a grand scale. This is one of the most well-known applications of bees in a commercial context, but there are many others. But while the value of commercial beekeepers is clear, that is not the focus for PerfectBee. Rather, our focus is the new and experienced individual beekeeper, who participates not for commercial gain or to provide a service, but for many of the other reasons beekeeping is such a glorious and fascinating pursuit. One can draw one’s own conclusions about whether individual beekeepers help “save the planet”, but it is true that collectively we are important to the future of bees. For most beekeepers, the non-commercial reasons to keep bees are all the motivation we need. Therefore, from our vantage point, making money is the least important of topics! As an individual beekeeper, it is our suspicion (and, frankly, our hope) that the possibility of making money from your beekeeping is low down your list of priorities. Certainly in the first few years, we hope there is so much to amaze you and challenge you that any financial opportunities are incidental, not focal. Despite that, it’s a pleasant reality that informal, hobbyist beekeeping can bring in a little pocket money, perhaps to offset some of the costs you incur. For some, a small start can lead to a deeper beekeeping experience which, in turn, can turn into a so-called “sideliner” opportunity. But for most, the chance to harvest some honey or render some beeswax is all that is needed. So what exactly are these opportunities to make a little cash? Let’s take a high-level look at some of these. The most obvious way to earn a little money is by making and selling honey. 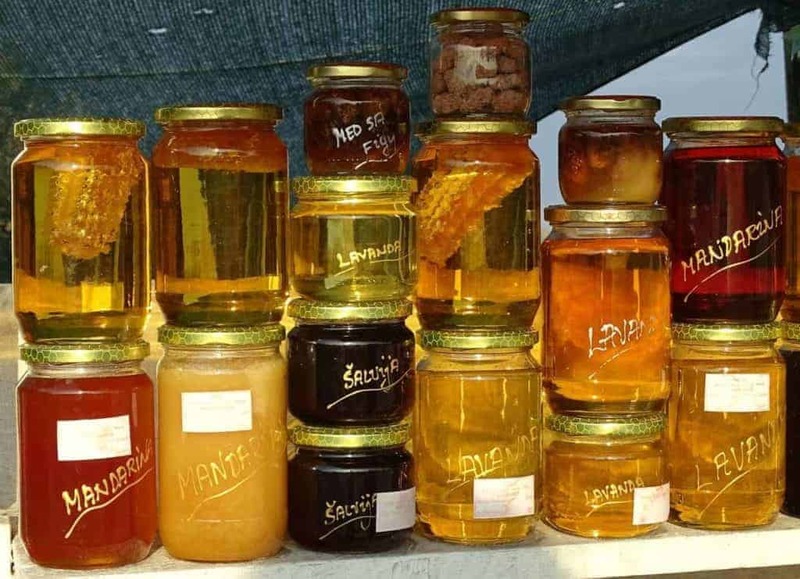 All beekeepers look forward to a few jars and as the number of hives grows it isn’t unusual to consider selling it. There are various forms of honey, included extracted, comb, chunk and whipped honey. The volume of honey you might expect from a hive will vary with location, weather patterns, race of bees and more. But, as a guideline, it isn’t unusual for a hive to produce 70 lbs of honey a year. Multiply that by the price you charge for a pound of honey and it’s clear there are a few pennies to be made. While this won’t make you rich, it can be a nice little earner, especially if a few hives are involved. While consuming honey for yourself or handing jars to friends and family is obviously very common, the goalposts move a little if you plan to sell your honey. Quite appropriately, there are rules and regulations to be considered when selling honey for a profit, driven by public safety concerns. You will need to check out state and local regulations. Regardless of your ambitions or your market, it is essential that you produce safe honey! Bees will do their part in creating glorious clean and safe honey, but problems often occur when we step in. A issue is the application of treatments. Some treatments should not, under any circumstances, be used when honey boxes remain in the hive. Read up and be aware of the requirements for handling and applying any treatment you use, particularly if you plan to harvest honey for human consumption. You may also need to consider labeling. Again, there are legal considerations when you sell food (nutritional labels, for example). But beyond the legal, there are marketing issues. Are you selling in an informal way, for friends of friends and with just a few jars per year? Or will this evolve into a regular appearance at the local farmer’s market or more? If so, you have issues to consider well beyond beekeeping, such as how you want to position your honey – local honey at a great price, premium “artisan” honey and so on. This leads on to branding considerations – do you have a company name, logo, jar design and label? In short, there is a lot to consider if you go over the line and plan to sell honey commercially. So, at least initially, considering making safe, clean honey and then giving it away. Honey is, of course, the prime candidate for earning a few dollars. But there are many other ways too. Selling beeswax products can have fewer complications than selling honey. It can take a while to produce and the process can be a little messy, but there is a wide market for beeswax, for all sorts of applications. The classic example, of course, is the production of candles. One great benefit of this is that you have so many options in terms of the shape, size, color and design of the candles, to distinguish your product. In addition, lip balm is another common product to be made by beekeepers from wax. One day we hope you will go beyond package bees nucs, to enjoy capturing swarms. It’s a fun and exciting way to obtain your bees. It can also earn you a little income, if you set up and offer a service. Even if you offer your services for free, you will potentially obtain new bees for free. And, to the layman, you look like a fearless superhero! We looked at ways the hobbyist beekeeper can raise bees. That is a uniquely fun and satisfying process but also has the potential to earn money. One of the more lucrative approaches is to consider particular characteristics of queens and focus accordingly. For example, queens with a proven resistance to Varroa mites have proven very popular. Similarly, beekeepers like to “buy local”, buying bees that have a proven record locally. While obviously beyond the scope of this introductory discussion, rearing and selling queens might be something to consider. One other thing to keep in mind. Regardless of what regulations you follow and how careful you are, if something untoward happens with any honey you produce and someone falls ill, consider the legal issues that may come from this. These are the types of issues any business owner needs to consider, regardless of the nature of the business. For the small beekeeper intent on just making a few dollars and keeping an easy life, this might be reason enough to keep things very simple and avoid the pull of commercial opportunity. Making money from beekeeping is a nice side benefit for many. Things change when a hobby that brings great joy suddenly becomes an important income stream. If full commercial beekeeping is not your call, consider keeping things intentionally small scale and informal and beekeeping with a smile!